birthday | I'm not stalking you. Christmas has Santa Claus. Easter has the Easter Bunny. Lost teeth have the Tooth Fairy. All these occasions have a character who delivers you the goods you feel you are entitled just because a certain event happens to take place on a certain day. I have always felt that birthdays should be the same way. After all, it is the most special of special days. Without your birthday, you would be, well, non-existent. Wouldn’t it be great if some sort of character brought you your gifts that day? Wait…Mr. Floppy from Unhappily Ever After is not what I had in mind. Now, I know you are going to say that Easter already has a bunny. But Easter also has eggs and chicks and sheep. The powers that be can just pick a new animal to adorn the packages of candy and toys. Heck, if we wanted to be truer to the origins of Easter, we should put zombie Jesus on everything. Zombies are still popular these days; that could prove to be a successful marketing strategy. Everyone loves zombies, the very young to the very old. Plus, if you give the bunny to the occasion of birthday, you get alliteration, which is always highly desirable. Just think, retailers can only use Santa during the last three months of the year, and Christmas in July. But people have birthdays ALL YEAR LONG! Every day someone somewhere is having a birthday. Stores could have on-going sales with tables of merchandise featuring stuffed animals of the Birthday Bunny and signage with him as well. Or maybe there could be one special sale day a month to cover any shopping for gifts for birthdays occurring that month. The increased visibility would push people to gift more quantity and more expensive presents to their loved ones. It would also encourage people to impulsively gift themselves for their own big days. Instead of rental halls being all booked up in November and December for Christmas parties, maybe celebration parties could be held instead for birthdays and staggered throughout the year. I picture the Birthday Bunny as pink and fluffy. But maybe he should be a more neutral color to appeal to both genders. Maybe a nice oatmeal tan would be good. And maybe he should be a “she.” Maybe the Birthday Bunny should be a nurturing female character. We do biologically require a mother to have a birthday, so it could make sense to have a motherly bunny to give you hugs and gifts and candy. This is still an idea very much in development. But I have had this in my brain for probably 30 years. Maybe I am just jealous that my January birthday gets eclipsed every year by Santa Claus, Rudolph, and Baby New Year. I think it is time for birthdays to be the blowout events they should be. Now, that is more like it! Posted in A day in the life, Entertainment Worship & Review and tagged Baby New Year, birthday, Birthday Bunny, Christmas, Easter, Easter Bunny, holiday, merchandise, Mr. Floppy, retailer, Santa Claus. Bookmark the permalink. My asbestos friend made me a very thoughtful, handmade birthday gift, and I just had to share it. It is a cross-stitch of the title of my book. And if you are wondering, “Why a cross-stitch?”, then you need to read the book. ‘Nuf sed. This is not the first cross-stitch gift I have received from friends. I guess I must surround myself with creative people. A close family friend has made me two large cross-stitch pictures over the years that now hang in my son’s room. When I got married, my green-haired friend undertook the ambitious task of creating a picture of the lighthouse bed and breakfast my husband and I honeymooned at on the shore of Lake Superior in cross-stitch. 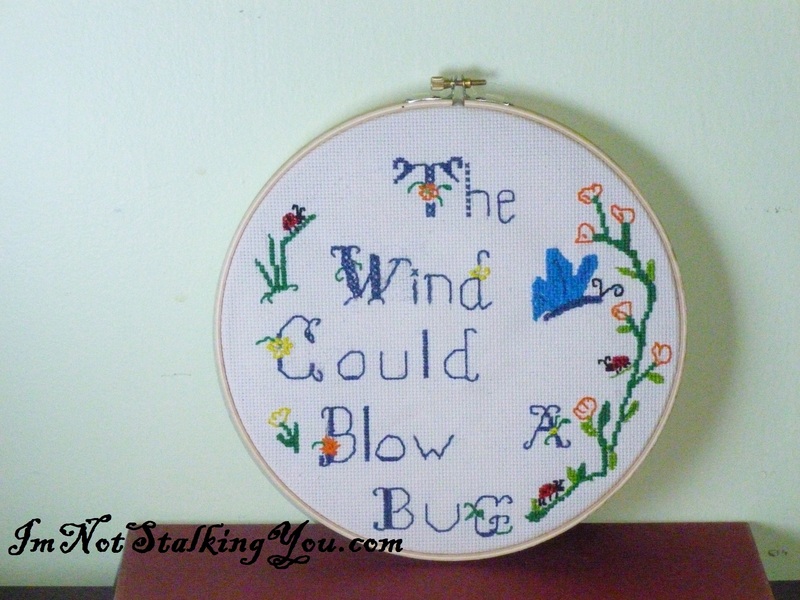 Posted in A day in the life, UnProfessional Photography & Artwork and tagged author, birthday, book, cross-stich, gift, hand made, lighthouse, sampler, The Wind Could Blow a Bug. Bookmark the permalink. This week I learned that something has been lost in this time of social media pandemonium. And I believe Hallmark would agree with me. My birthday was this week. I remember when people actually went to the store, carefully spent time hand-picking a greeting card for you that semi-suited your personality, forked over hard-earned cash at the register, then had to actually know your physical address to mail the card, adding a stamp also purchased with hard earned money. A few days later, you received this wonderful declaration of how much someone loved you, with colorful ink, heartfelt words, and maybe a fart joke imbedded on card stock inside an envelope. And some people just like to get cards because they expect cash or check or a giftcard inside. But that isn’t me. 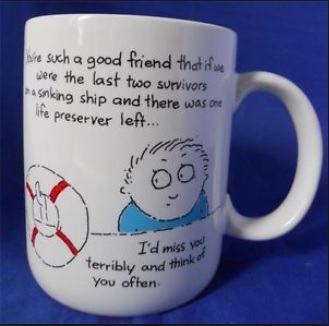 It was always the thoughtfulness behind the card that I liked most. I would get birthday cards as a kid, and set them around the house to enjoy them long after opening the envelope. Greeting cards have slowly been replaced by electronic email cards, email, texts, etc. This year I got no cards in my mailbox for my birthday. I blame that on 4 things. 4. No one loves me. 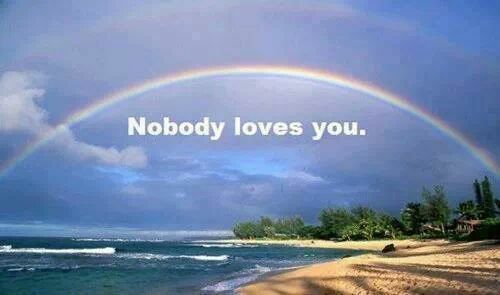 The wise rainbow knows all. People so willingly enter their birthdays into Facebook, then on their birthday it will remind all their friends to wish them a “Happy Birthday”. I’m sorry, but this feels like cheating to me. I don’t give Facebook my birthday for several reasons. One of them being on my birthday, I don’t want hollow birthday wishes. I totally admit that some of my facebook friends are more acquaintances than my besties. And this is fine. But is it wrong of me to still feel like someone should put a little effort into wishing someone else a happy birthday? I admit, I am lax in this department as well. But some of my Facebook friends don’t even know my physical address or in what city I live in. Even MY MOM didn’t get me a birthday card this year. Ugh. I am just a person who likes to hold on to the old ways. 2013 was the first year that I went electronic with my personal organizer and address book. It may be another 5 years before I embrace this Facebook birthday thing. Which, by then, Facebook will be replaced with some other media with a goofy name. Posted in What I Learned This Week and tagged American Greetings, birthday, bitter, cards, envelope, Facebook, greeting, grumpy, Hallmark, old school, social media, wishes. Bookmark the permalink.